Thursday 24 th July 2014 @ 7.30pm. Bottesford Chapel Meeting Room, Devon Lane. Is anyone available to represent the project on Saturday July 12th 2014 at the From Pit to Trenches: First World War Remembrance? West Hallam Village Well Dressing Weekend @ 1.40pm to place a Poppy for Pte Clifford Miller. And to take photographs. Mike Meech reported volunteer time now exceed the 200 days. The sensitivities of negotiating access to treasured items were discussed. 5 people attended the Ancestry Training session held on Friday 30/5/14 (SP, DM, SH, WW, GC ) – Positive feedback about its value. Let DM know your intention to take up a subscription so that subsidy canbe paid. Anne Ablewhite (Parish Councillor) suggested that the Beacon could be lit on an appropriate occasion as part of the Centenary. Liaise with PC to coordinate with project events. 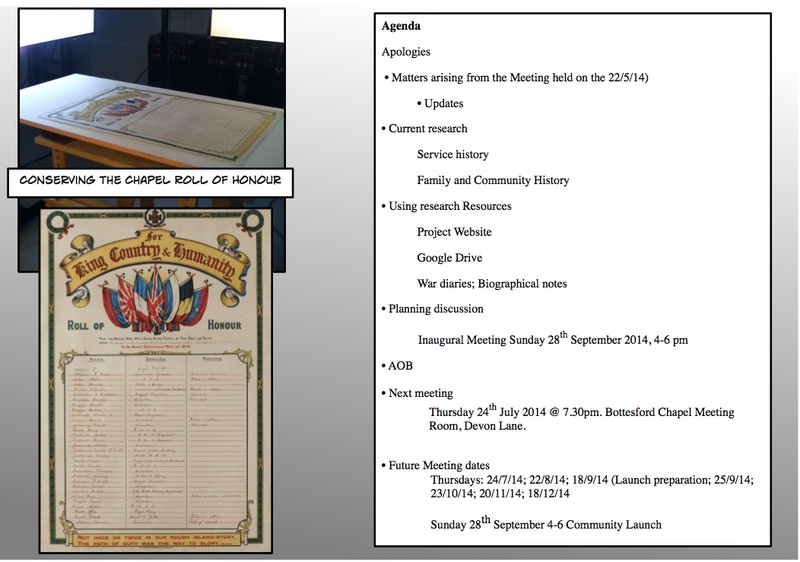 Discussions held with the Flintham HLF supported WW1 project. Invite Flintham volunteers to attend meetings. Project access to War Diary summaries and service record notes established. Liaise with St Mary’s re final date. Liaise with Isobel Daw, Val Lever, Barbara Cobb re music programme and other concert content. Contact during the month with both Guides and Scouts. Set up meeting(s) with Scouts (Simon Ashworth) and Guides (Gill Smith) for activities associated with the Spring 2015 exhibition. Bottesford History web site reviewed as an existing resource and starting point for research. The project section is now populated with the main categories activities of the Centenary Project. Pages for all those named on the two war memorials to be completed (photograph of person, obituary, and CWGC Memorial Certficate). Use comments to add research material for incorporation into the web page for each person. War dairies summaries, service records and biographical notes as resource for writing the 40 memorial biographies. Identify DOD’s and transcribe War Diary entries to establish the circumstances of their loss. Map out the chronology of their wartime experience for each of the 40 listed on the two war memorials based on battalion War Diary entries and place in Google Drive Biographical files. Add material to Biographical web pages either a comments or in the text of the pages. Timing discussed – Sunday 27th September or Saturday 1st November? Research 1914 ringers named in the 7/11/1914 Grantham Journal. Contact David Jones to coordinate date timing of the event. Neil Fortey reported the offer of memorabilia. Neil Fortey reported the developments concerning the PC’s application fro HLF support to Heritage Centre facilities in the Old School. The value of the PC initiative for securing the legacy of the WW1 Centenary project discussed. Interest questionnaire circulated for completion. Contact with Muston Heritage via the regular Tuesday Muston Old School Coffee Mornings (10.30 am). Thursday 24th July 2014 @ 7.30pm. Bottesford Chapel Meeting Room, Devon Lane. This page was added on 23/06/2014.